Beach Lane Books, 2017. 44 pages. Here’s a picture book adventure story featuring animals. I expected trite, corny, or hokey. What I found was charming and marvelous. The day the antlered ship arrived, Marco wondered about the wide world. He had so many questions. Why do some songs make you happy and others make you sad? Why don’t trees ever talk? How deep does the sun go when it sinks into the sea? But when he posed these questions to the other foxes, they grew silent. “What does that have to do with chicken stew?” they asked. Marco goes to the harbor to see the ship and learns that the crew of deer onboard are lost. They hope to hire better sailors. Marco signs on, in hopes of finding other foxes who know the answers to his questions. A flock of pigeons, led by Victor, signs on, hoping to have adventures. The original deer crew, led by the captain Sylvia, are looking for an island with tall, sweet grass and short, sweet trees. No, Marco doesn’t eat the crew. He makes a warm and reviving stew of vegetables and revives his friends to continue their quest. And though the others’ initial quests are satisfied, the friends decide that they want to travel on…. The beautiful illustrations by Terry Fan and Eric Fan add just the right touch to give the animals’ efforts seriousness. At the same time, their naïve ideas are child-sized. Children will delight to share the adventure. 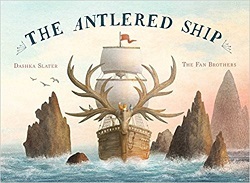 This entry was posted on Saturday, December 30th, 2017 at 11:17 pm and is filed under Adventure, Animal Characters, Picture Book Review, Starred Review. You can follow any responses to this entry through the RSS 2.0 feed. You can leave a response, or trackback from your own site.